Wright offers unparalleled, on-site technical assistance for user agencies and contractors. By providing this service on-site, Wright is better able to analyze the situation, provide real-world solutions and deal with any additional issues that may occur. This combined with Wright’s expert staff enables us to provide the most comprehensive on-site technical assistance available. Troubleshooting is another personalized service that Wright provides its customers in an effort to fully support the products we manufacture. By offering troubleshooting services, Wright can quickly and accurately determine problems that may have occurred and provide real-time solutions that can reduce unexpected costs and man hours. No special equipment, no special handling requirements, no special testing requirements, no special characteristics beyond standard binders and SBS modified binders. 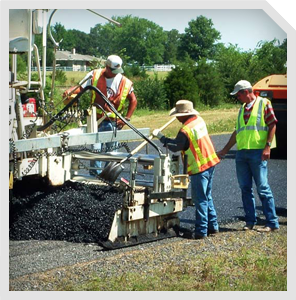 Meets all Super Pave Testing requirements. No special DSR gap settings, no elimination of solubility standards, no reduction in settelment and storage stability expectations and standards.